Maybe you can help me out here, because I'm not sure what the actual name of this type of toy is. I've seen loads of them over the years, mostly made from wood, so bear with me while I show you what we did and then if you know what these toys are called, please do comment to let me know. 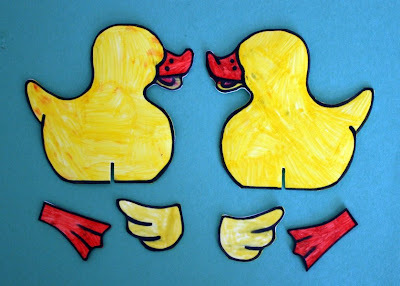 First of all I cut out the craft foam into two sides of a duck shape, with two wings and two feet. The kids set about colouring these while I put together the structure of the toy with an exacto knife and a glue gun. 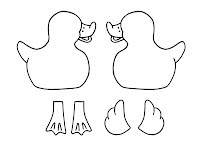 I've made a copy of the duck shapes that I drew in case anyone wants to make one too. Just click on the thumbnail below and save the full resolution jpg. It's US letter sized, so if you're printing A4 then select "fit to page" when printing, or you'll have bits cropped off. 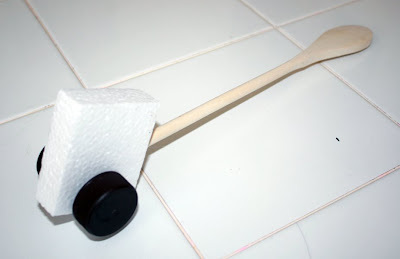 To make the very simple mechanics of the toy I first stuck the wooden spoon into the styrofoam and glue gunned it in place at the angle that I wanted the handle to be. 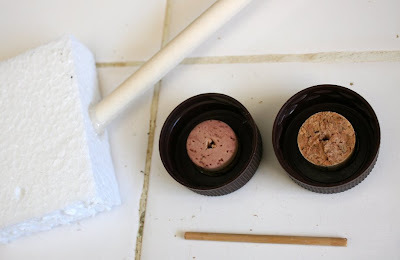 Then I cut off two circles from the cork that were about 1cm thick and stuck a skewer through them for the axle to go into. Then I glue gunned the cork pieces into the center of the bottle caps and used the skewer to poke a hole in the styrofoam for the axle to go through. 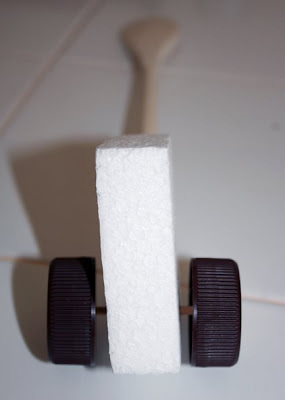 glued the axle into one wheel, threaded it through the styrofoam and glued the other wheel on the other side. Easy peasy. 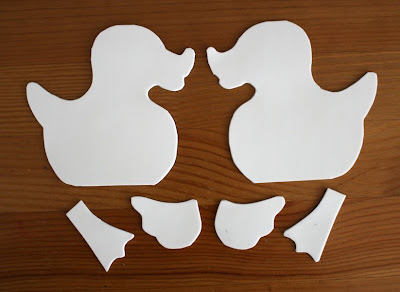 Here are the duck pieces after the kids had coloured them in. 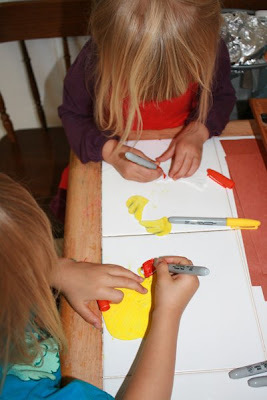 Great by the way if you have two kids, because each kid gets an identical body, wing and foot to colour, so no fighting! 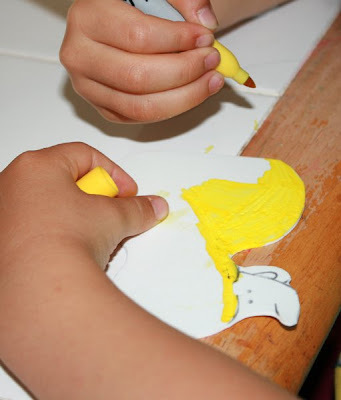 Then all I had to do was glue on the ducky decoration and it was ready for action! The feet were glued at right angles to the circumference of the wheel and they were placed on opposite sides of each wheel (6 o'clock and 12 o'clock), so they moved in a right, left, right, left stepping motion. Here's a quick vid showing the flippy floppy action of the feet. 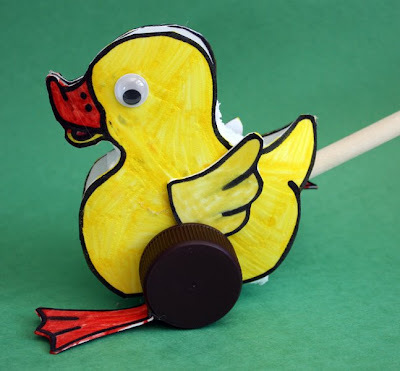 If you offset one wheel high up on the axle and one low down then you will get a wiggling sort of walk, which would be very cute for a waddling duck. I'm thinking of making another of a frog, but offsetting both wheels high on the axle and having the two feet glued at the same o'clock in the hopes that it would produce a hopping effect. Cheap as chips and when they kids don't want to play with it anymore, you just put all the parts back in the recycling and reclaim your wooden spoon. So come on, what is this toy called? They must have been around for hundreds of years! They can't just be called wheelie stick toys surely? Darn! That's so cute but I can't help you with the name of the toy. I've been wondering myself! We have one in wood at home, with rubber feet. Our 15-month-old's favorite toy (after the forbidden markers whose nibs she uses as pacifiers). I'll come back here to check if any other commentor has put us both out of our misery by revealing what it's called. I have no idea what this is called, but the one you made is so cute! Any toy that you pull on a string or push with a stick are just called 'pull' or 'push' toys. There are a variety of different designs of ducks, trains, trains of ducks, dogs, telephones, popping marble bubbles and such. And again... i really need to make this just to keep my inner child happy and its awesome because my adult eco-friendly self is all for it too!! This is soooo cute, I love it! What a fun and satisfying project. I'll be linking. How do you figure all this stuff out?? 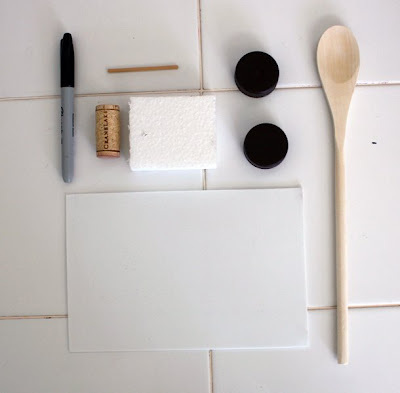 I absolutely LOVE this project and especially your resourcefulness. I love the little ducks I see at the store, can't bring myself to buy it of course but now I don't have to! I think I'll try it in wood (or fabric?). I just love your blog. You are so inspiring. I loved your Wall.E and Rocketship too. Thanks for the great ideas!!! I didn't understand how you glued the feet on- what did you attach them to, and what sticking agent did you use?